Cruisers are more exposed to damaging sunlight than most. 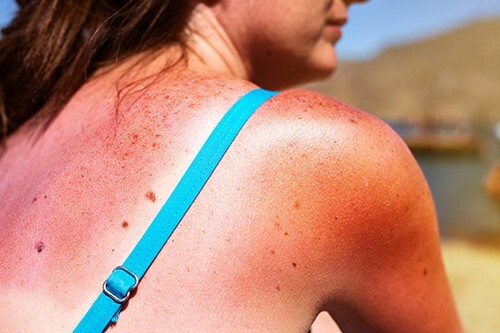 Here are some insights in how to protect yourself against exposure to UVA/UVB. Nearly everyone knows that excessive sun, or at least extra ultraviolet (UV) radiation, is not good for you. But what works best to protect against exposure on a boat? Control: As a control I took measurements directly into the noon sun on a cloudless sky. The reading, and the highest that will register on the instrument, was 10,000 units. Deep shade, away from the water, registered between 500 and 600 units, about 5 per cent. Sunscreen: I put a very light smear of SPF 15 sunscreen on the plastic wrap and took another reading, again in full sun; UV reading was reduced to about 2,000 units. With a thicker spread of SPF 15, the readings fell to half of that. SPF 60 sunscreen yielded a reading of 600 units, which is about the same as readings taken in deep shade. Reflected light (off the sea): Perhaps the most interesting readings came from pointing the unit toward the sun at 45 degrees off the water, simulating "reflected light." This delivered a reading of 2,000, only 20 per cent of full, direct sunlight. That was much less than I had expected. Also, in the middle of the cockpit, where the light was still very bright but not directly from the sun, the measurements were equivalent to deep shade. Vinyl: I also took measurements through the clear plastic of the vinyl dodger, both new and old material, and the measurement was, again, zero. Even old and weathered vinyl cut out 100 per cent of the UV rays. Glass: Our hard dodger has large pieces of tempered glass and I was surprised to find that it only blocked 10 per cent of the UV rays. Clothing: An old white T-shirt, even when wet, blocked about 95 percent of UV, while a dry shirt let through somewhat more. I was particularly surprised by that given all the hype about UV protective clothing. My test suggests that just about any clothing that covers you works well, even if it doesn't have a "UV rating". It is important for everyone who spends a lot of time in the sun to understand what to look for before a pre-cancerous spot becomes cancer and spreads because the earlier it's discovered, the better the survival rate. Unchecked, melanoma is often fatal, in part because even an advanced case often doesn't look like much, just a mole with irregular borders. The American Cancer Society has some useful tips. Follow the link below.